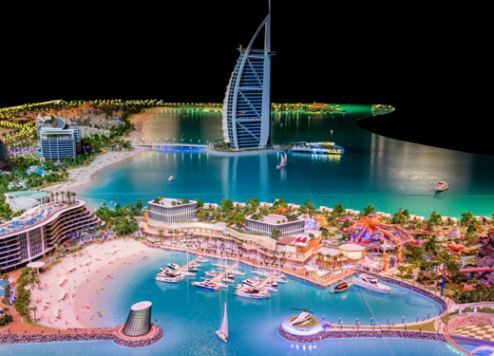 Dubai has revealed plans to develop a new US$1.7 billion tourist resort on two manmade islands – one on each side of the iconic seven-star Burj Al Arab. The new mega development, unveiled by Dubai’s Ruler, Sheikh Mohammed Bin Rashid Al Maktoum, will span an area around four million square feet. Dubai Holding is spearheading the project, named Marsa Al Arab, which is expected to be completed by 2020 when the emirate plans to attract 20 million visitors annually. One of Marsa Al Arab’s islands will be dedicated to entertainment and family tourism and the other will feature luxury villas and a private marina. The family resort island will see the Jumeirah Group, which is part of Dubai Holding, introduce new leisure concepts and services as well as a family-oriented hotel. It will also house a 1,700-seat theatre, which will become home to the world-renowned Cirque du Soleil show. In addition, the Wild Wadi Waterpark will be moved from its current road-side location closer to the beach, and will be more than double its existing size when fully completed. Dubai Holding will also develop ‘Marine Park’, a first-of-its-kind marine life edutainment centre in the Middle East, and a live theatre with a 1,000-seat capacity that will attract world-class shows to showcase various elements of marine life. Marsa Al Arab will include a private marina and a yacht club, a diverse range of food and beverage outlets, and a helipad. A mixed-use convention centre capable of hosting large international conferences and festivals is also planned. It will be connected to a business-orientated hotel. The project’s retail space will span some 20,000 square metres and replace the current Wild Wadi Water Park area. This shopping centre will comprise international high-end brands and a selection of restaurants and cafés. Dubai Holding will add 2,400 hotel rooms to Jumeirah Group’s portfolio when the new unified tourism destination, which includes the company’s existing hotels, is complete, bringing its total offering to 8,428 rooms. There will be 400 new F&B outlets added, as well as new features such as pedestrian pathways, a jogging track, large swimming pool and a cycling course. Jumeirah Group will offer 10,000 additional parking spaces to accommodate the anticipated influx of visitors. The project will break ground in the coming weeks.